JUNE 15, 2017: The approval of the Saugus retiree COLA cap from the $12,000 to $14,000 was reasonable, overdue and justified because of the current financial success of the Saugus retirement system. Credit for its success should be given to its Retirement Board, town manager, selectmen and the Town Meeting members for its commitment in staying the course with its funding schedule. Unfortunately, the Saugus FinCom painted this kind of picture without knowing or understanding the real facts. First of all, Saugus has used the $12,000 COLA cap since FY 1998, which means for the past 20 years NO retiree has received more than a $360 annual increase, the new cap means simply a Saugus retiree can receive a maximum $420 annual increase. In 1998 the average Saugus retiree was receiving less than $12,000 and now receives close to $25,000. Clearly the 20-year-old standard should be updated somewhat and $14,000 is reasonable and responsible. There are only several public retirement systems in the state that remain at the original threshold with better funding ratios and they too need to take a look at their funding status to give something back to their contributing members as did Saugus. It was time and the Town Meeting members recognized the need to update this COLA cap to a more 21st century standard. The answer can be found in the preliminary actuary valuation results that show that Saugus will be very well funded as of Jan. 1, 2017, with a 75 percent funding level, and some $90M on hand. This represents assets sufficient enough to pay 75 percent of all pension liabilities of all employees and retirees in Saugus. And with such assets, along with a funding schedule that the Retirement Board and town has committed to by accelerating its funding over the past several years, including this year’s aggressive level, costs will begin to diminish over the next several fiscal years. In the very near future, within the next several years Saugus will see a significant reduction in costs, over $5M. Clearly the asset growth of the Saugus retirement system which has gone from $30M in 1998 when the COLA cap was put in place, to the current level around $90M shows it was time to make this plan change and thank the retirees and employees who have contributed throughout their careers and whose money has played an important role in the success of the Saugus retirement system. One certainly should view the numbers and facts of the financial status of this system as a public pension plan where the glass is “half full,” not empty. 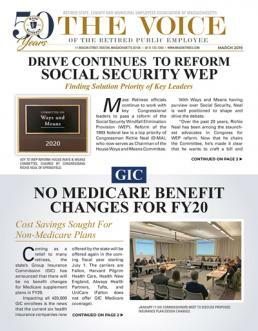 Mass Retirees President Frank Valeri, a Saugus resident, wrote the following letter to the editor at Wicked Local Saugus.